Bob and Mike Bryan got up close and personal with some of their closest fans on Ladies Day Thursday. The lucky group of 20 women purchased a special ticket package that treated them to a pre-match brunch at STRIP, a trendy Atlantic Station restaurant, followed by a meet and greet with the whole Bryan family … father Wayne and mother Kathy included. The ladies were given a quick Q & A with the boys, and asked questions ranging from Mike’s gluten and dairy-free diet to how their famous “chest-bump” originated. The ladies smothered the boys with attention, and made sure to ask for plenty of pictures and selfies to show their friends back at home. After the meet and greet, the ladies were sent off with VIP gift bags chock-full of spa passes, free samples and four drink vouchers to use in their VIP suite seats for the day. 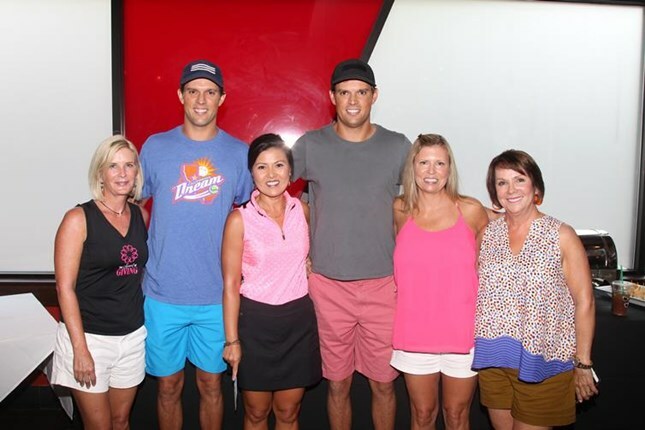 “It’s always great to just have a girls’ day, but having a few drinks and then meeting the Bryan brothers is just icing on the cake,” said Cindy Martin, a Ladies Day VIP attendee, Atlanta native and a self-described huge Bryan brothers fan. The Bryan brothers are known in most any tennis household in metro Atlanta, and have had a warm welcome from the city as they go after their 107th title at the BB&T Atlanta Open as the No. 1 seeds this week.